New York internists use electrocardiograms quite often as they are one of the best means of assessing the overall “health” of the heart. 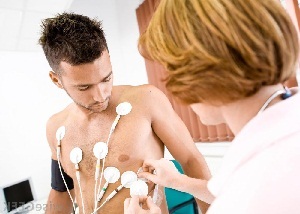 Electrocardiograms, otherwise known as “EKG”s and “ECG”s, are painless tests that measure the electrical activity of the heart. Small electrode patches are placed directly onto the skin of your chest, arms, and legs, as you lie on the table a machine takes readings of the electrical impulses that travel through your heart. It is quick and efficient—in fact, it takes less time to run the test than set up for it! When you arrive in the room where the EKG will be performed, you will be asked to take off all jewelry and to remove things like your wallet or cellphone from your pockets. If you are a man, you’ll be asked to take off your shirt so that you’re bare-chested over the course of the test. If you’re a woman, you’ll need to strip down to your bra, a gown or a shirt. The EKG test is entirely safe. Remember, the electrodes attached to your body simply monitor the electrical activity of your heart — they do not in any way transmit electricity to your body from the machine. Dr. Gafanovich will recommend that you get the EKG test only if, after asking you a number of health-related questions, she determines that you might be at risk. After reviewing the rest results, she will get back to you if anything of concern is found. Upper East Side physician, Dr. Gafanovich uses the test to diagnose poor blood flow to the heart, evaluate heart abnormalities, assess your heart’s rhythm, and (in some cases) even diagnose a heart attack.